Salvinorin B ethoxymethyl ether (2-O-ethoxymethylsalvinorin B, symmetry) is a semi-synthetic analogue of the natural product salvinorin A, with a longer duration of action of around 3 hours (compared to less than 30 minutes for salvinorin A), and increased affinity and intrinsic activity at the κ-opioid receptor. 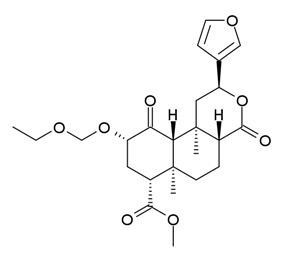 Like the related compound herkinorin, 2-ethoxymethyl salvinorin B is made from salvinorin B, which is most conveniently made from salvinorin A by deacetylation, as while both salvinorin A and salvinorin B are found in the plant Salvia divinorum, salvinorin A is present in larger quantities. Salvinorin B ethoxymethyl ether has a Ki of 0.32 nM at the κ-opioid receptor, and around 3,000 times selectivity over the μ- and δ-opioid receptors, making it one of the most potent and selective kappa agonists yet discovered. In animal studies it fully substituted for salvinorin A and the synthetic kappa agonist U-69593, and was active at doses as low as 0.005 mg/kg. Human bioassays found the compound to be active at 50 μg. ^ Lee DY, Karnati VV, He M, Liu-Chen LY, Kondaveti L, Ma Z, Wang Y, Chen Y, Beguin C, Carlezon WA, Cohen B (August 2005). "Synthesis and in vitro pharmacological studies of new C(2) modified salvinorin A analogues". Bioorganic & Medicinal Chemistry Letters 15 (16): 3744–7. ^ Medana C, Massolino C, Pazzi M, Baiocchi C (2006). "Determination of salvinorins and divinatorins in Salvia divinorum leaves by liquid chromatography/multistage mass spectrometry". Rapid Communications in Mass Spectrometry : RCM 20 (2): 131–6. ^ Munro TA, Duncan KK, Xu W, Wang Y, Liu-Chen LY, Carlezon WA, Cohen BM, Béguin C (February 2008). "Standard protecting groups create potent and selective kappa opioids: salvinorin B alkoxymethyl ethers". Bioorganic & Medicinal Chemistry 16 (3): 1279–86. ^ Baker LE, Panos JJ, Killinger BA, Peet MM, Bell LM, Haliw LA, Walker SL (April 2009). "Comparison of the discriminative stimulus effects of salvinorin A and its derivatives to U69,593 and U50,488 in rats". Psychopharmacology 203 (2): 203–11. ^ . 2008;16(4):136-45.The Entheogen ReviewFirst Look at a New Psychoactive Drug:Symmetry (salvinorin B ethoxymethyl ether).